Howdy Danger | Cycling, photography, life. The folks over at Cycle Exif have posted an article covering a beautiful new steed crafted by one of my favorite builders, Bishop Bikes. 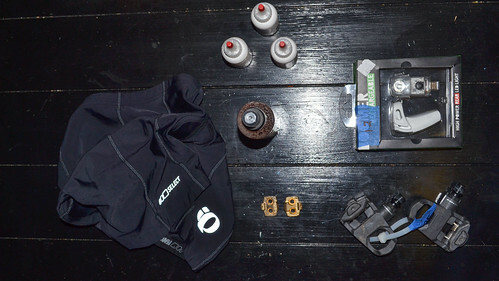 Head over to Cycle Efix’s Blog for more info on the build and great photos showing off the details. Here’s another video of an awesome journey on bikes, this time following Lucas Brunelle and friends as they traverse the Darien Gap, a huge swath of Jungle between Panama and Colombia. 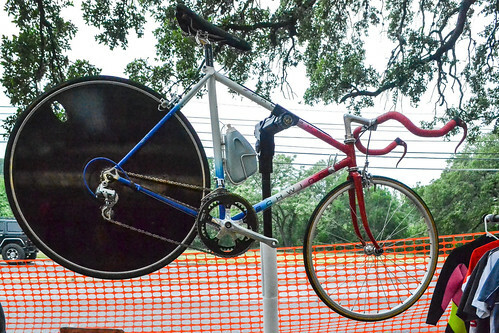 Check out more rad videos on Cinelli’s Youtube! It’s raining here in Houston thanks to #hurricanepatricia so what better way to spend the day than watching videos of someone else riding their bike! Cycle Around Japan is a series that explores Japanese Culture and Life from the saddle of a bicycle. This episode follows Michael Rice as he journeys through Japan’s Autumn mountains to visit two world heritage sites, Tomioka Silk Mill and Nikko Toshogu Shrine. Not only do we get a unique insight into Japanese history and industry but we also get an inside view as to the preparation needed to make the journey by bike and how incredible that can be. What a badass trip this would be! Here is the latest trials edit from Danny MacAskill. If you’re not familiar with this dude, check out his other amazing videos on Red Bull’s youtube channel. This video featuring Chase Hawk, a BMX rider for Etnies, is awesome! The edit follows Chase as he rides around and talks about his life in Austin. Check it out! I bought this Kazane track frame at the end of last summer off craigslist. I had been looking to upgrade from my Pake for quite some time and when I saw this frame I had to act. I had been seeking a lugged steel ride for a while and the sparkly white paint job was an added bonus. It took me almost a year of parts hunting to piece it together. 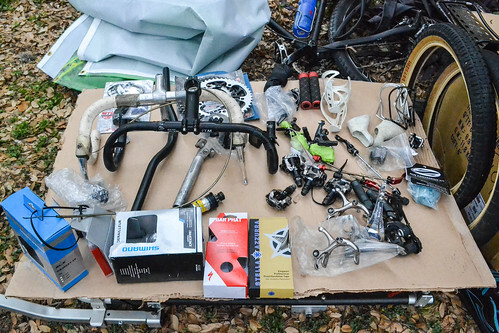 Most of the components, including the seat post, headset, crankset, and pedals, came from craigslist. I even traded a saddle I got off craigslist for the Selle Italia saddle on there now. Craigslist is pretty dope. The wheels however I actually had to build up entirely. The original wheelset I had in mind was no longer available so I ordered everything separately and it couldn’t have turned out better. I had Christian at Austin Bikes build and true them for me, so as to make sure they were dialed right. Click on any photo above to peep the set! If you have a bike or a new build you would like photos of, email me @ thomas.epling@gmail.com We can ride to which ever choice spot you like, I’ll share your rad ride on here and give you copies. Win Win! My buddy Karl has had this beauty built up for quite some time and after waiting for some decent weather we were able to get out and take some photos. The most striking detail of this build has to be handmade titanium frame nicely contrasted against the black and pink components Karl carefully picked out. Some of the finer details include Phil seat clamp, hubs and BB dust cover, Sugino 75 crankset, and Thomson seat post and stem. Click on any photo above to launch the gallery view and make sure to follow Karl on Instagram. The title says it all. The guys at GCN went to the Colnago factory in Italy and filmed a craftsmen putting a steel frame together. The whole process is pretty neat and the end result is badass. Check it out! 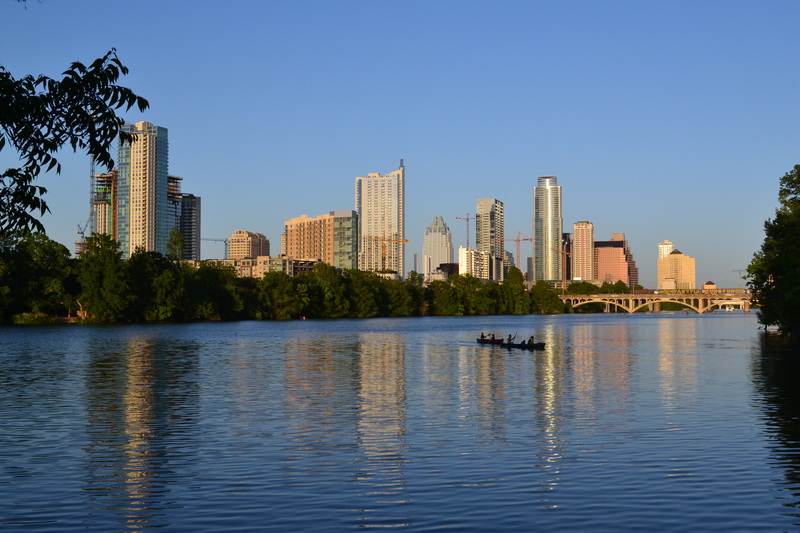 If the weather where you are is as gorgeous as it is in Austin, you gotta be outside. Clear skies, comfortable temps, and a bike make a wonderful mix. If you’re free this weekend get out there and explore! 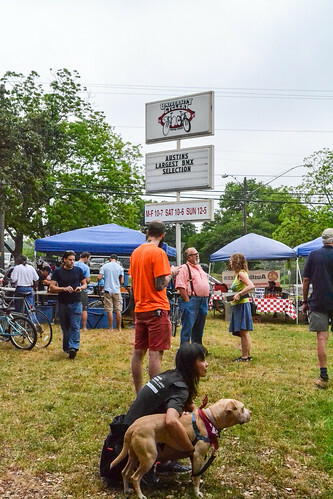 Last weekend was the Frankenbike swap meet for April. After tacos and coffee at my house, Karl and I rode over to the meet being held at University Cyclery at 29th and Lamar. I wasn’t sure what to expect since neither of us had been to the shop, but there was a good amount of space for vendors to setup. There’s ALWAYS something interesting at Frankenbike, like this steel Schwinn Funny-bike sporting a carbon Sugino 75 Chainring. And the guy was only asking $600 for the whole thing! It might still be up on craigslist. The trick we found is to comb through EVERYTHING and to do that at least twice. It goes something like, comb, mingle, repeat. And there really is no end to the cycle. I went to one table three times and bought something each time because I hadn’t noticed it before. 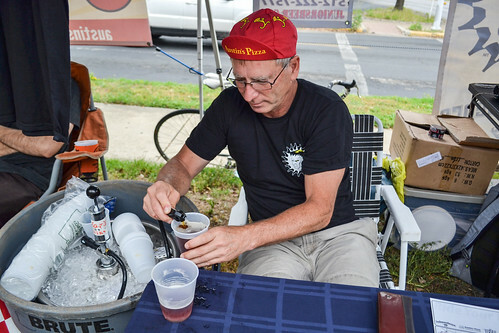 There was of course free beer provided by Independence Brewing Company which was refreshing and delicious. I totally snagged one of the Austin’s Pizza caps too. It turned out to a be a really badass day for Karl and I. Apart from the parts you see above I also snagged a Specialized Elite Columbus steel frame with Chris King headset! I got it at a great deal from Andy, the owner of the Hub Cyclery. If you’re ever in San Marcos make sure to check out their shop in the square. To see the whole gallery for this meet head over to my flickr!